This Lent, President Matthew C. Harrison encourages purposeful time spent in prayer. Read A Simple Way to Pray for President Harrisons explanation of how the Rev. Dr. Martin Luther encouraged Christians to pray. President Matthew C. Harrison looks at the topic of joy in the life of the Christian, reminding us that our ultimate cause for rejoicing comes from Christ Himself. Read President Matthew C. Harrisons discussion of how love for the Gospel and love for ones neighbor is Witness and Mercy at work. LCMS President Matthew C. Harrison calls for repentance and prayer this Advent. 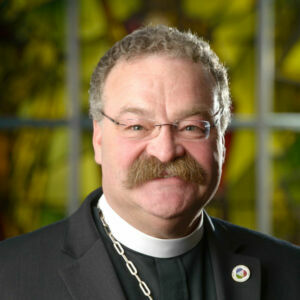 President Matthew C. Harrison addresses the cultures negative impact on the Church and how Lutherans can take concrete action in defense of marriage, families and the Gospel. Matthew C. Harrison commemorates C. F. W. Walther, the Synods first president, by recalling Walthers desire to return to Scripture and to the Confessions. Our hearts are purified by forgiveness in the Sacrament of the Altar, and we have access—unhindered and rendered holy by Jesus—to stand in the holy presence of God Almighty. Pres. Matthew C. Harrison explains why the LCMS’ two seminaries are vital in spreading the Gospel of Jesus to a broken, suffering world. We need to preach more about the Gospel!” a wellmeaning pastor admonished his brothers at a pastoral conference. At my request, The Lutheran Witness staff has put together this issue to inform the good folks of Synod about the financial realities that we face. The funding of this multi-billion-dollar institution called The Lutheran Church—Missouri Synod is complex, to say the least. Learn more about the Synod’s blessings, gifts and challenges. What is the source of our Resurrection joy? President Harrison reminds us that Jesus’ death is our hope and comfort in the midst of life and especially at Easter. In the midst of a weak economy and unstable foreign relations, not to mention a country increasingly unwelcoming of the Lutheran faith, it can sometimes feel like there is little hope for the church. President Harrison reminds of Christ’s love and the strength that is ours in Him. This month, Pastor Harrison offers some practical and hopeful ways for the church to begin to move forward in Christ-centered unity. For more on pastors preaching the Gospel, congregations showing mercy to their neighbors, and the church living together under Christ’s forgiveness, read on. In this month’s letter, President Harrison concludes his series of three articles on the “Witness, Mercy, Life Together” emphasis for the church and the world. To find out more about these themes, check out www.lcms.org/emphasis. 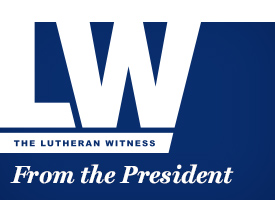 In this month’s letter, President Harrison continues his series of three articles on the “Witness, Mercy, Life Together” emphasis for the Church and the world. To find out more about these themes, check out: www.lcms.org/emphasis.